The Ham-Let Group has manufactured high-quality instrumentation valves, fittings and auxiliary products for fluid systems in a variety of markets since 1950, and has now launched its first smart valve ready to connect to the Internet. The company has incorporated cloud-based technology into its products to increase reliability, reduce costs and open up new possibilities that were previously too expensive or too complex to implement. As a complete oil and gas portfolio company, Ham-Let continues to make efforts to supply unique safety solutions that bring best value in terms of total cost of ownership. The Ham-Let IoT-H800L ball valve delivers maximum reliability and high lifecycle for general service applications in the instrumentation field and has integrated IIoT sensors to provide a variety of services that improve performance and total cost of ownership. Users benefit from this unique design which increases productivity by sending real-time alarms and collecting and sending essential data securely to the cloud or to servers on premise. 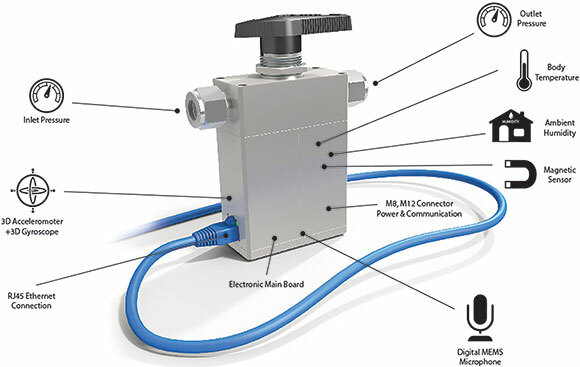 The valve uses innovative technology to measure media and ambient environment through built-in sensors (temperature, inlet and outlet pressures, acoustic, vibration and humidity), which use programmable rules to control the valve. For example, the valve automatically shuts off when a differential pressure limit is reached and sends real-time reports and alarm notifications in case of abnormal operation. This reduces total cost of ownership by eliminating the need for peripheral sensors and their associated fittings, and by eliminating leakage risk. The IoT-H800L ball valve is built on open architecture to enable quick customisation and integration into current frameworks utilising common communications protocols with built-in integration to IIoT clouds. These unique capabilities make the valve flexible enough to fit any scenario that users require to solve local business challenges. The Ham-Let Group have been chosen to operate a laboratory of technological innovation on behalf of the Israel Innovation Authority. The laboratory will focus on technologies in the field of intelligent process industry and the IIoT. The purpose is to encourage industrial corporations, especially those involved in advanced production, to take part in cooperative ventures with technological entrepreneurs as a lever for growth and the building of future strategy. The laboratory will serve as a structured platform for cooperation between industrial corporations and start-up companies in a variety of fields such as automotive, robotics, 3D printing, and others. Ham-Let has one of the most advanced production plants in Israel with extensive investment in infrastructure and technology, making it ideal for entrepreneurs in the field of smart industry to examine new technologies. The unique equipment to be used by the start-up companies that will be absorbed in the Ham-Lat Group includes metalworking machines, robotics, electro-polishing systems and advanced coatings, welds and orbitals, a wide range of unique machines, ultra-clean rooms for manufacturing and development laboratories. Ham-Let’s technological laboratory intends to absorb many projects in a wide range of fields. Each project will be evaluated in accordance with the laboratory’s ability to assist and in accordance with its relevance to the interests of the Ham-Let Group. The laboratory is supported by a specific ecosystem for technology companies with partners, including academic institutions, business centres, and investment bodies. It is an important addition to the industrial companies with whom Ham-Let operates on a regular basis, which include hundreds of local and international manufacturers.